A healthy hamster is a happy pet and everyone wants a happy pet. Luckily it is quite easy to make sure your cute friend lives a long and healthy life. A proper diet, fresh water, and a nice, clean habitat, go a long way in preventing illness and injury. You want to make sure his home avoids drafts, excessive heat and dampness, as well as provides exercise and suitable hiding places. 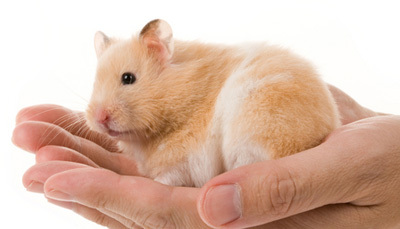 Protecting your hamster by carefully handling him and preventing a nasty fall will also keep your pet safe. Even with quality care, a proper diet, and a wonderful habitat, injuries and illness can occur. In the event of one of these unfortunate occurrences, contacting your veterinarian is always recommended. Signs of illness may be weight loss, loss of appetite, and behavioral changes. Below is a list of the more common issues that can affect a hamster’s health. For broken bones, isolate your pet and keep him in a cage without a wheel. Do not handle him and make sure you feed him a good diet with a calcium supplement. The break should hopefully heal nicely within two weeks. Hamsters do fight with each other and a bite can be one outcome. If a bite does occur, clean the wounded area with peroxide and if the injury leads to infection, contact your veterinarian. These injuries can occur during a fight or your hamster may find a sharp object in the cage and cut its cheek pouch. An abscess can happen when a wound heals over before the infection inside is gone. It can look like a swollen area and will be very tender to the touch. There can be redness of the skin and your hamster may scratch at or around the area. A hamster’s front incisors are designed to rub against each other while nibbling and are suppose to wear evenly, but this doesn’t always happen. The unmatched teeth can hinder eating and may grow into the roof of the mouth or cheek pouch. Hamsters do develop eye problems in response to eye injuries or infections. They can also develop cataracts. Symptoms of respiratory infections are labored breathing, discharge from the nose and eyes, loss of appetite and weight loss. Symptoms of gastrointestinal infections are a stained tail, diarrhea, lethargy, failure to eat or drink, irritability and ruffled hair. Fungal infections are caused by damp, dirty, housing and inadequate diets. Symptoms of heatstroke are heavy breathing and the animal laying on it’s belly. A hamster can die quickly if you don’t take immediate action. Move the cage to a cool spot. Take him out of the cage and run cool water, not cold, over it’s body until it is alert and breathing has slowed. Dry it off gently and place it in a clean dry cage away from any heat to rest. To rehydrate your pet you can use an eyedropper to offer your him water or Pedialyte. Never leave your hamster’s cage by a sunny window, in your car, or an unventilated room.